Blogs eventaa- One stop solution for all your Event Industry needs! Home Blogs & Article Hindi One stop solution for all your Event Industry needs! Event industry, being the huge one, has multiple requirements. Finding your needs in the event industry can be difficult. But, if you know the right place to initiate your search, the work’s done easily and quickly. The requirements may be from the event companies, event managers, venue owners, service providers, vendors or the public in general. The need for a platform that can bridge the gap in the Event Industry was the reason for the birth of eventaa.com. Planning and organizing events are now at your fingertips! Today eventaa.com has become event industry’s global business networking platform, which has assisted thousands of people in fulfilling their daily Event Industry needs. 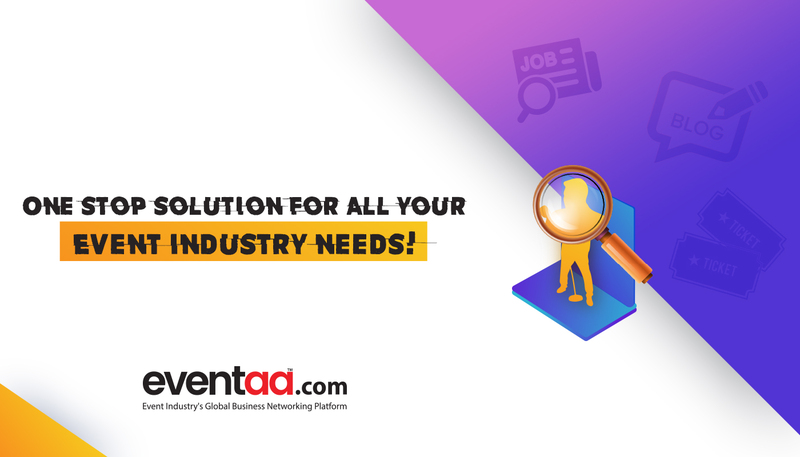 eventaa.com is the only search engine of Event Industry, with 80,000+ registrations from more than 400 cities and towns, that allows you to find relevant information from more than 1500 categories in the event industry likes artists, service providers, decorators, and venues. The business exchange has been specially crafted to help event industry’s specific requirements, and on the other side, these requirements serve as a business opportunity for the event industry. A multi-purpose platform that lists the upcoming events on a regular basis and also supports the event industry, by letting them post their upcoming events and at the same time offering a ticketing platform for selling tickets and boosting the events digitally. A space that lets you (event companies, wedding planners, party organizers, artists, decorators, light, sound, florists, venue owners etc.) showcase and archive your best work and enables the user search your work through your company/artist name, client name or the year during which the event was held. Job feature is critical for both the employers and employees of the event industry. Employers can post their vacancies and also search profiles while employees can post their resumes and even search for suitable job opportunities. With eventaa news, you will be updated with the latest technology and happenings of the Event Industry. Most knowledge gaining section of eventaa.com, where one can learn a lot of things from the experts and leaders of the event industry and the key insights of the event industry. The features mentioned above is just the tip of the ice burg, eventaa.com is way deeper than that, so feel free to explore the website and express your experience about the eventaa.com in the comments below.